BECA is currently updating its policy platform. Its past advocacy platform is covered in the below. 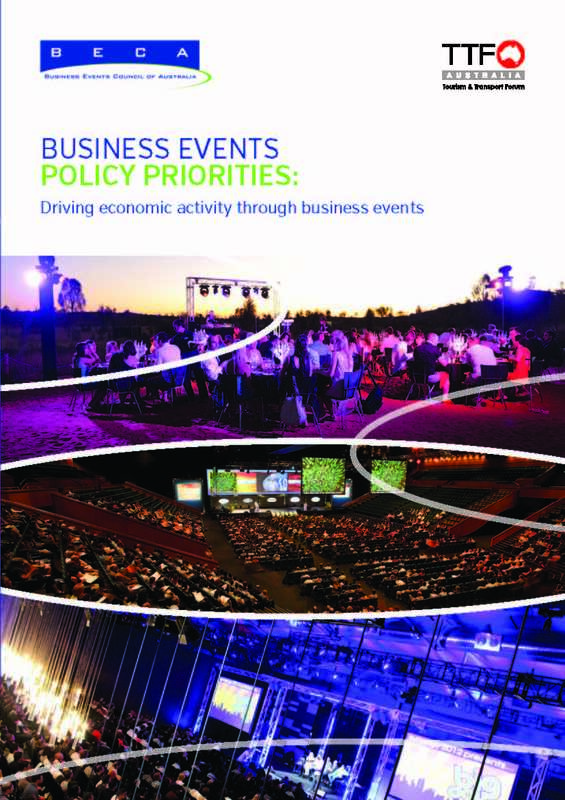 The Business Events Council of Australia represents the business events industry and as such has developed in consultation with the industry the Business Events Policy Priorities. A lengthy process of consultation facilitated by the Tourism & Transport Forum has enabled the industry to agree on what the key priorities are and how we need to work with government to deliver them. The business events sector is a $24 billion industry, expected to grow to $31 billion by 2020. It employs 214,000 people and injects $11.4 billion in gross value-add to the Australian economy. Whether for meetings, incentives, conferences or exhibitions, business events bring together leaders and decision-makers from a vast range of industries including health, science and technology, resources, banking and finance, to do business. This business in turn generates economic activity, creates jobs and delivers opportunities for Australian trade and investment. to countries willing to incentivise business and to secure international events for their countries. Develop a whole-of-government approach among Commonwealth ministries, departments and agencies to support business event bids. The Australian economy has seen the benefits of investing in a strong business events sector, both nationally and abroad. In 2011-12, State governments invested approximately $10 million in additional subvention funds to secure business event bids, delivering an additional 125 events and $387 million in economic activity to the Australian economy.3 Government funds are only expended if the event bid is successful; guaranteeing return on investment. The industry is now seeking Commonwealth support to leverage the work of state and territory governments in the development of a National Business Events Support Fund. The Policy Priorities have been put together in a document which we encourage the industry to use.